This striking flower pattern punched tin star lamp is a perfect addition to bring warmth to your rustic decor. 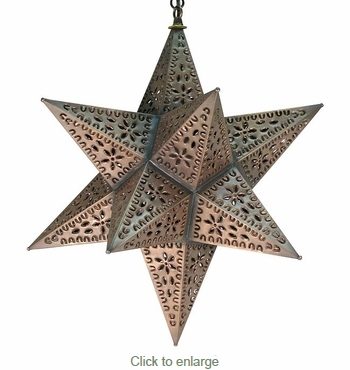 This authentic aged tin star light was handcrafted and punched by artisans in Mexico. These star light chandeliers complement any rustic d�cor including Spanish colonial, southwest, Tuscan, or Santa Fe.